SecondMarket opened up its private company stock marketplace in early 2009 and gave employees at hot startups something they never had before – an organized place to sell their stock even before the company went public or was acquired. For the first time the company is releasing information on private company buy/sell demand and completed transactions. Most companies don’t like SecondMarket one bit, at least at first blush. Companies don’t want random outsiders holding their stock before they’re public. And they don’t like some employees having liquidity events before others, it tends to screw around with morale. And there are also legal and tax issues. Stock options must be priced at “fair market value” or both the employee and company face tax consequences. The board of directors usually sets the common stock price at a fraction of the preferred price. But when there are verified third party purchases on places like SecondMarket, the companies have to use those sales as a guide. The result is higher priced options for all employees. But we’ve seen a big evolution in startup stock dynamics over the last year. Companies like Facebook and Zynga have created controlled secondary markets for their employees to sell stock, generally at around 65% of the preferred price. Yelp seems to be doing the same. Giving employees a way to “take some money off the table” isn’t such a bad thing after all. Think of it as releasing some of the steam in the pressure cooker. Second Market says that just over $15 million in transactions were closed through them in December 2009. 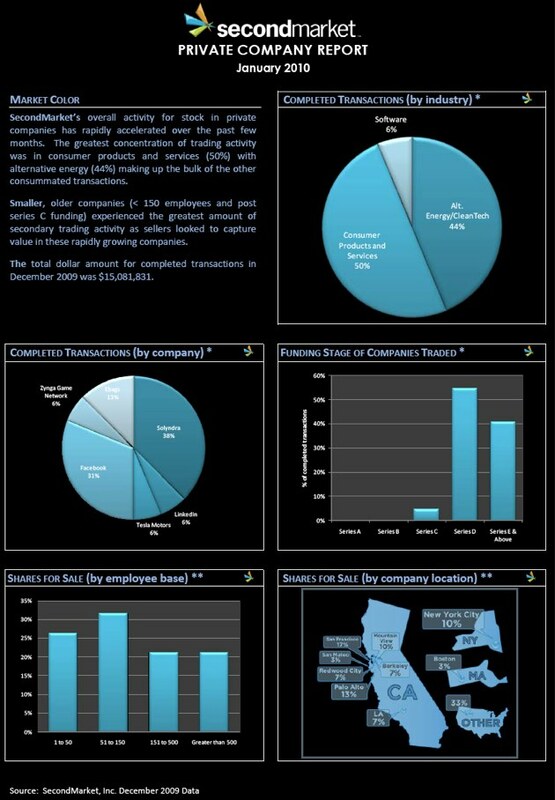 The top company was Solyndra, with 38% of the transactions, followed by Facebook with 31%. Ebags was next with 13%. LinkedIn, Zynga and Tesla Motors each took 6% of the total. In all, half of the transactions were for “consumer products and services,” which includes website services like Facebook. Alternative Energy/Clean Tech took 44%, and software took just 6%. The vast majority of completed transactions were for later stage companies that have raised at least three rounds of capital. 64% of transactions were for startups based in California, followed by New York (10%) and Boston (3%). Part of the sky-high price around consumer website stocks like Facebook and Twitter is due to an imbalance of demand and supply. 70% of buyer demand is around those stocks, but just 20% of the overall supply is. Employees from a wide variety of startups want to sell their stock, but most of the demand is for the hot Internet stuff, and Tesla (which has 5% of demand).